Thank you very much for continuing support of my Ice Queen Hat Pattern for little girl! 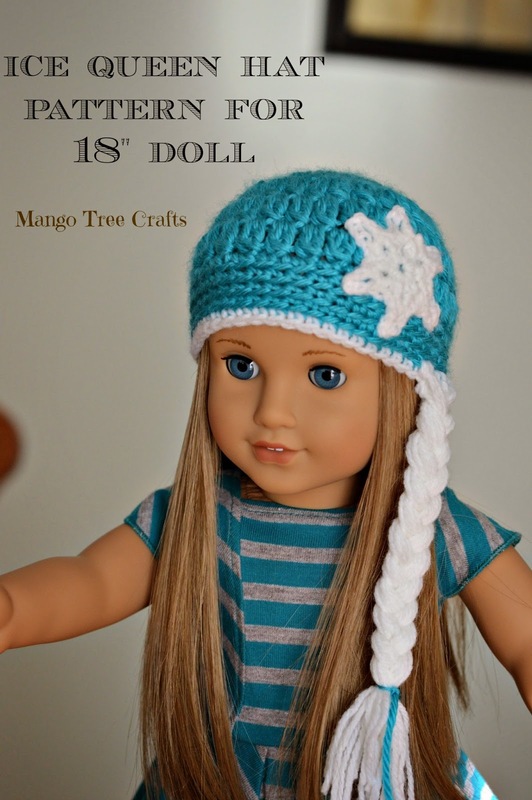 Here is an addition to the pattern – Ice Queen Hat pattern for an 18” American Girl doll! Yarn used: Caron Simply Soft Acrylic yarn in colours “Blue Mint” and “White”. Any worsted weight yarn would work for this project. join, continue working in spiral (45). Round 7-9: SC in each stitch around in back loops. Crocheting in back loops gives your ribbing a nice ribbed look. Round 10: Change the colour to white and work one round of SC in each stitch around in back loops. Join with SL ST at the end of the last round. Fasten off and weave in ends. great free pattern by Attic 24. I made only two rounds of the snowflake, so it is not too big. I left a long tail and sewed the snowflake to one side of the hat. To attach the “hair” cut about 14-16 strands of yarn that are about 18-20” long. Secure strands (two at a time) by looping them around the bottom single crochet edges where you want your braid to be – I suggest using the same side where you sewed the snowflake appliqué. Then add more strands above the bottom edge strands. Braid yarn, tie bottom of pony tail with another strand of yarn – I used an aqua piece of yarn. Girl and doll pattern paired together create an awesome Dolly-and-Me look! i LOVE this pattern and so did my grand daughters. Thank you for sharing it with everyone. Thank you very much for for comment Oneita!